Last week a new bike station opened in Washington, D.C. on prime public space – next to the city’s Union Station. Bike centers are popping up in other cities, with some of the most successful being co-located with parks and trails. The facility cost $800,000 and came from a combination of federal funding, city money, private contributions and the bike shop. The spot is modeled after another popular bike station we also visited last week in Chicago’s Millennium Park. The McDonald’s Cycle Center offers 300 secure spaces along with lockers, showers and a repair shop. It also offers rentals, which were totally sold out when we visited on a sunny September Sunday. Completed in 2004, the structure cost $3.2 million, with some federal congestion mitigation assistance. The stations can also be complementary elements to transit facilities. 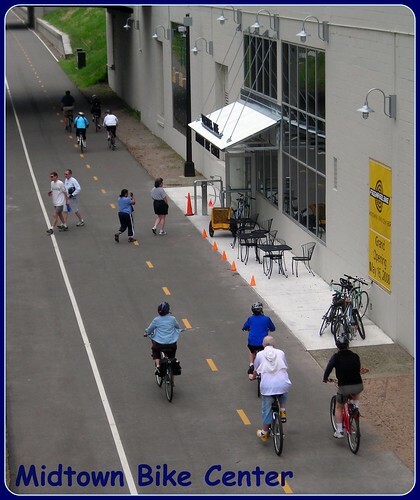 In Minneapolis, planners hope to have a trolley line adjacent to the bike trail. The center is already a short distance from an existing light rail station and buses. The Chicago station is a stone’s throw from the city’s commuter Metra line, and in Washington, D.C. the building is located at the meeting point of Amtrak, commuter rail, subway and bus.